Tonight, President Serzh Sargsyan, who is in the Kingdom of Belgium on a working visit, met with the newly elected President of the European Parliament Antonio Tajani. Prior to that, the President of Armenia gave an interview to the Euronews TV network. Responding to the questions of the reporter, the President spoke about the Armenia-EU relations and prospects of their development, the strategic Armenia-Russia partnership, which is a pivotal area of Armenia’s foreign policy, Armenia’s opportunities of development after the accession to the Eurasian Economic Union and his vision for the future of that structure, Armenia’s potential in exporting goods to Europe, cooperation with NATO and forthcoming programs, reasons behind his absence on the electoral roll of the RPA, Armenia’s future after the transition to a new system of governance which stems from the constitutional changes. At the meeting with Antonio Tajani, President Sargsyan took the opportunity to once again congratulate him on assuming the position of the President of the European Parliament and expressed confidence that during Mr. Tajani’s tenure in office the highest legislative body of the European Union will continue to bring its substantial contribution to the further advancement of that reputable international structure. The President of Armenia expressed hope that Antonio Tajani’s activities will promote also the upward development of the Armenia-EU relations. Serzh Sargsyan and Mr. Tajani recalled warmly their meeting in Brussels in 2008. 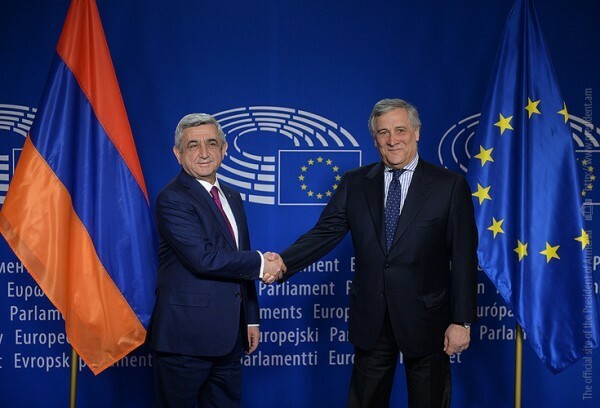 The President highly valued Mr. Tajani’s unequivocal and principled position on the issues related to the basic human rights which was manifested also during the adoption by the European Parliament of the resolution on the centennial of the Armenian Genocide. The President of Armenia cordially invited the President of the European Parliament to conduct a visit to Armenia, to familiarize first hand with the developments going on right now in our country as well as with the rich spiritual and cultural heritage of our country. The President expressed confidence that the visit by Mr. Tajani will be a strong message, especially considering the fact that Armenia is making a transition to the parliamentary system of governance which is characteristic of the European democracies. The parties spoke about the interparliamentary cooperation and noted with satisfaction that active relations with the European Parliament are being developed. According to President Sargsyan, the constitutional changes implemented in Armenia will allow the future parliament, which will have greater authorities stipulated by the Constitution, to be even more active in the issues related to the cooperation with the EP as well as the EU member states. 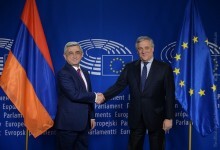 In the strengthening of democratic institutions in Armenia, Serzh Sargsyan assessed as invaluable the continuous assistance of the European Union which, according to the President, will undoubtedly get a new impetus after signing the new framework agreement which regulates the Armenia-EU relations. President Sargsyan expressed gratitude to the members of the EP who, responding to the invitation of the Armenia side, will attend as part of a monitoring mission the parlimantary elections in April which take place for the first time after the constitutional changes were made. The parties discussed also the regional developments, existing problems and challenges, and in that context referred to the NK peace process. The parties stressed the importance of solving the conflict in the framework of the OSCE Minsk Group. The President of Armenia informed Mr. Tajani about the situation at the Artsakhi-Azerbaijani line of contact, spoke about Azerbaijan’s destructive and provocative steps. President Sargsyan hailed the efforts of the parliamentarians, who have visited Artsakh personally and know for sure what the people of Artsakh want. Serzh Sargsyan expressed his concern and condemned the fact that Azerbaijan has declared a manhunt against these members of the European Parliament.